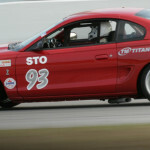 1994 Mustang Cobra running SCCA STO class. In 1993 Ford unveiled the Mach III at the North American International Auto Show in Detroit. 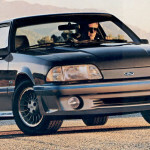 In 1994, evidence of that concept car came to life as the 4th generation Mustang. At first glance, there were many changes to the 30 year-old pony. New exterior and interior designs were praised. Most of those changes were skin deep. In fact, the 1994 platform (code-named SN-95) used the same chassis as the Fox platform. There were some notable changes to suspension, powertrain and brake systems, but the performance was essentially identical to the previous year. The track and width have been slightly increased for 1994. The changes to control arm length and spindle location help improve both. For the first time a 17” wheel option is available with a 245/45/R17 tire option. There were three power options for 1994. The base Mustang had a 3.8L V6, the GT featured a 5.0L V8 and the Mustang Cobra offered 25 additional ponies from a 5.0L V8. * Car & Driver, 5 speed Manual transmission.